Hempshill Vale again..minus the snow..needs a bus wash though. 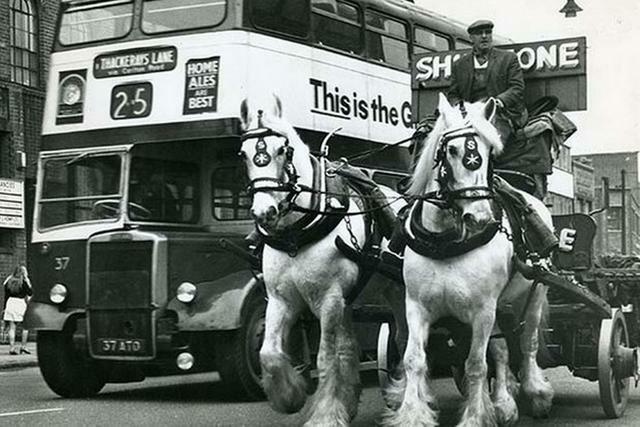 Even those bendy buses would be better than the silly trams we have now!! ...thanks from Timeless moments..those blue & yellow NEP Austins dashing about....brilliant snip of our past. Don't get much better than this. 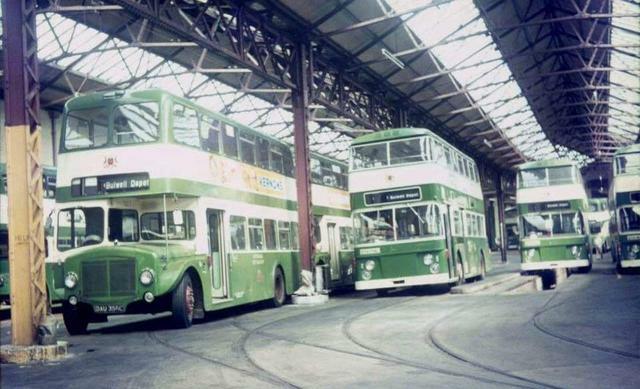 Bulwell Depot- Piccadilly. Good bit of forward planning i think, in anticipation of things to come!! Obviously didn't plan for the building to go though, never mind, they can't think of everything!! If my memory serves me correctly, just near the old newspaper place on parliament st, the road was dug up years ago and not far beneath the surface were the old tram lines. I would think that it's the same in other parts of Nottingham as well. 37 ATO passing out a beer dray. Interests:Christianity, classical music, old Nottingham. Where actually was Bilborough Depot? I know, obviously, it was in Bilborough!! Plantfit just beat me to it ! On a current map look for Harvey Road (off Beechdale Road) in Bilborough. 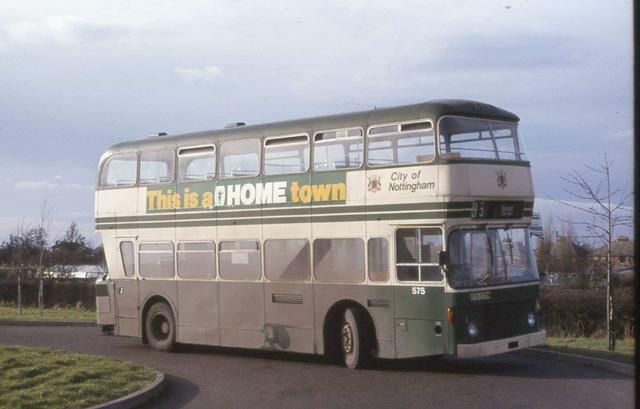 There is a large building now occupied by Nottingham City Homes; that was the bus garage. A significant loss to the Forum - we need to ensure we don't lose any more !! I would be guessing about 1977. Thanks everyone, I've found it on the map. Back in the 50's when the trolley bus termini were at Trent Bridge and Wilford Bridge, did they stack the busses ready for the Saturday afternoon football turn out? I can't remember, but hardly anyone had a car and many of the away side supporters would need to get to Midlands or Vic stations, in addition to the thousands heading back to town or Bullwell etc.. I'm not sure if there were ever any 'Football Specials' which went as far as Trent Bridge; I think people walked from the stations (anything from Vic would've gone to High Level) and/or the city centre. There's lots of old photos showing a solid mass of people walking along London Road towards whichever ground, and even now on a match day it's quicker to walk along there than drive. Early eighties there were football specials from Trent bridge to town, if there were any spare drivers on Saturday afternoon. Not sure but I think they went to Market and Trinity square. 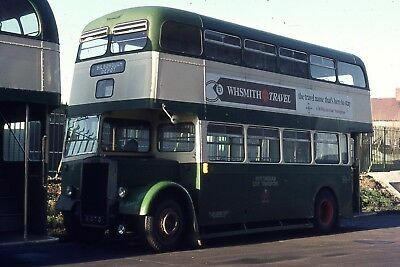 I remember 'special' buses in the sixties which used to park up at the end of the embankment on match days. Not on the turn-round, on that stretch just through the gates. Not sure if they were trolleys though. As CT says, the vast majority of the crowds went up London Rd and on Arky they often spilled on the road holding up traffic.. I'm pretty sure there were no trolley wires along Victoria embankment, just some down to Trent bridge depot. Correct BK, the trolley wires used to finished at Trent bridge end of the embankment, the other trolley wires were at the halfpenny bridge end of the embankment. Weren't there trolley wires from the works, down along to the end of Bunbury St and left on to the last section of the Embankment to the gates?